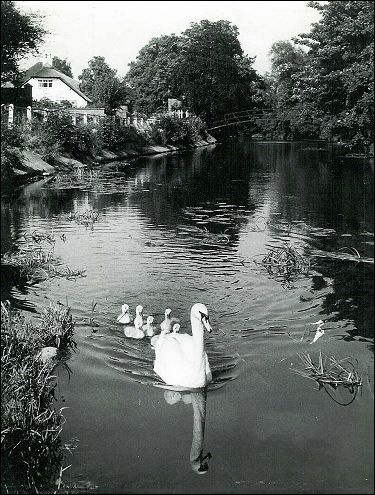 The river at Soar Road, Quorn about 1960. During the 1930's and 40's village children would spend most of summer months swimming here. Few houses in Freehold Street had bathrooms at the time and it was common for menfolk to take a bath in the river with a block of carbolic soap. The railings on the left between the road and river have since been replaced by a substantial flood prevention wall. The curved footbrige can be seen in the distance - this takes you across to land that is almost an island (now Proctor's Park) but connected near to the bridge in Barrow upon Soar. The footbridge has now been condemned and is not available for use.